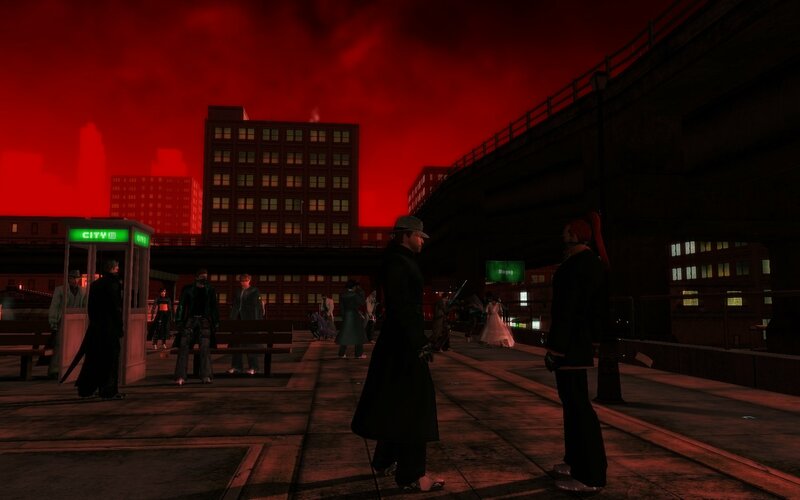 With the climate-controlling Sati still in the hands of the General, the weather within the Matrix took a dramatic turn for the worse, signified by a vivid red hue that caused concern even for the normally aloof Architect. While his Sentinel fleet assaulted the General's base code-named Stalingrad on the Earth's surface (as seen in the chapter 7.2 cinematic), within the Matrix, Machine forces steadily overthrew the General's systems, even as Zion, with the aid of Seraph, searched for Sati, eventually rescuing the girl from the General's control. The harried General came to rely more and more on the support of his new ally, the Merovingian. The Merovingian, however, showed a marked disregard for the preservation of the General's commando programs, going so far as to use them as cannon fodder for his own aims, and even secreting some of them within his own hidden constructs, unknown to the General. Meanwhile, the Merovingian continued his project of eliminating that frequent foil of his plans, the Oracle. He brought a deadly program known as the Apothecary into the Matrix, putting her to work on a code powerful enough to kill the fortune-teller, who managed to complete the kill-code despite much interference by the Machines. As a reward for the Apothecary's hard work, the Merovingian, at the instigation of his wife, Persephone, betrayed the Apothecary to the Machines, and she was deleted by a group of hostile operatives. In the midst of these warring forces, the signal of Morpheus continued to appear to followers of Zion and E Pluribus Neo, declaring that Neo lived, a prisoner of the Machines, and calling on the assembled operatives to fight the Machines in order to rescue the One. Certain inconsistencies and glitches in these signal broadcasts began to raise doubts, however, particularly after E Pluribus Neo found that the signal, made to look like an emergency hovercraft beacon, was in fact originating within the Matrix itself. The recuperating Cypherite leader, Cryptos, whose Machine overwriting had just been violently purged by Seraph, finally appeared and spoke to some of his operatives, who to their dismay found his mind clouded, and prone to wandering. Evidently, the Machine program that had been controlling him, though overthrown, was now partially merged with his previous, violently anti-Machine psyche. The Cypherite controller, Veil, viewing her crippled leader with disdain, took command of the organization, leading them in attacks against the Apothecary, and against their mortal foes, E Pluribus Neo. The Cypherites succeeded in capturing an EPN crew, and defended themselves, with help from the Machines, against a counter-attack led by the EPN controller, Shimada. Veil also came to an agreement with the Machines' Agent Pace to resume spying operations in Zion, with the aim of discovering the destination and purpose of large amounts of material and personnel apparently leaving the caves of Zion. Eventually Cryptos, sufficiently recovered, met with the Machines' Agent Gray, complaining of the pain of his current existence, and asking to be reinserted into the Matrix, as Cypher himself had asked of Agent Smith. Much to the Cypherite's surprise, Agent Gray told him that there was no such procedure. E Pluribus Neo strove to make further contact with the mysterious Morpheus signals, receiving aid from the Oracle in locating them. The authenticity of the signals came more and more into question as they continued to preach the same message of war against the Machines. To put these questions to rest, EPN sought to trace the signal to its origin, even in the face of Machine attacks. They succeeded in this endeavor, finding, to the dismay of many, that the signals, encoded in the form of emergency broadcasts from Morpheus' hovercraft, the Nabonidus, were in fact coming from a source within the simulation itself. EPN also found themselves under increased pressure from the Cypherites, led by the aggressive Veil. They attempted to rescue an EPN crew member captured by the Cypherites, but were unable to reach the operatives, who were guarded by massed forces of Cypherites, Machines, and even some Merovingian operatives. As the battle for Stalingrad raged in the Real, the Machines began a concerted takeover of the General's systems inside the Matrix, commandeering his helicopter fleet, his communication channels, and even his holographic broadcast. They closely pursued the Apothecary, taken from their servers and brought into the Matrix by the Merovingian without their consent. The Frenchman meanwhile struck down Agent Pace with a preliminary version of the Apothecary's kill-code destined for the Oracle. The Agent recovered quickly, but seemed altered, adopting a colder, more businesslike demeanor, and demonstrating a heightened enthusiasm for the violent suppression of System enemies. Following the successful termination of the Apothecary, the Machines located, assaulted, and disabled the General's primary base in the Matrix, found in the complex inhabited by Project Nine soldiers beneath the Abandoned Subway. 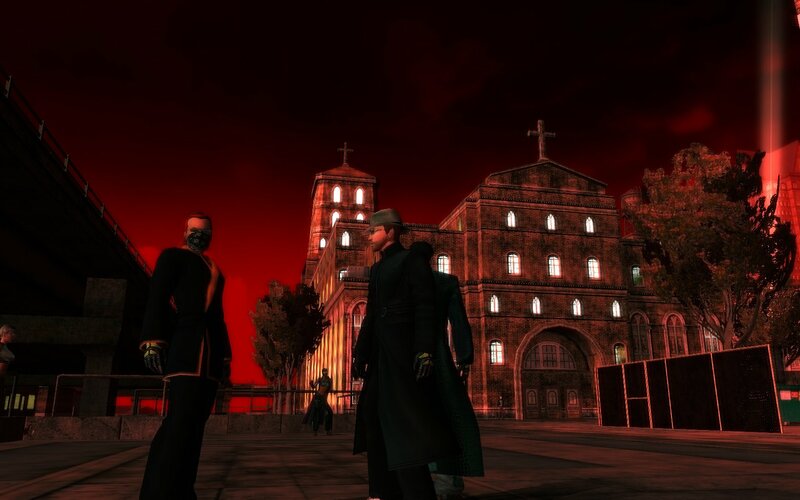 They then shut down the General's network within the Matrix entirely, and prepared to continue with further operations against the Merovingian, who gave the harried General asylum. The Merovingian, wanting to kill the Oracle, had the Trainman bring the program known as the Apothecary into the Matrix, and put her to work on a kill-code powerful enough to eliminate the fortune-teller. Blood samples from Sati and from the irradiated ex-Unlimit commander, Beirn, were obtained to increase the code's potency. The Merovingian wished to test a preliminary version of the code, and the General suggested the Machines' Agent Pace as a test subject. Persephone lured the Agent to a rendezvous where a Merovingian hit squad, armed with kill-code samples, struck down the Agent, much to the Merovingian's delight. Spy reports confirmed that the code had made a lasting impact on the Agent. The Apothecary eventually completed work on the code, despite continued interference from Machine attacks. Frustrated by the constant threats to her safety, she demanded transport out of the Matrix, which the Merovingian promised to grant her. However, partly at the instigation of Persephone, who had a longstanding feud with the Apothecary, he instead tipped off the Machines as to her location, and the kill-code manufacturer was deleted in an attack by hostile operatives. Under increasing pressure himself from the Machines for sheltering the General, the Merovingian, unknown to his would-be ally, began smuggling the General's commando programs into hidden constructs under his own control. Zion worked with Seraph to track down Sati, held prisoner by the General. After fighting through many platoons of the General's commandos, and solving a perplexing assault by Sati doppelgangers created by the General, Sati's program was retrieved and restored to the Oracle, who declared that the girl would soon be well, and able to restore the weather to its normal condition. Although they succeeded in guarding the Oracle against attacks by the General, Zion decided that her usual home in Mara had become too easy a target for the General and the Merovingian. With Seraph's support, they finally managed to persuade her to leave the neighborhood, and began moving her under guard between secret safehouses across the city. Zion also tracked the Morpheus signal, eventually finding it and catching it as a strange glitch occurred, causing it to repeat the same line four times. This raised further suspicions about the signal's true origins. Tracking was complicated by the appearance of die-hard Morpheus supporters, wishing to emulate and further his old agenda. The Machines developed code routines capable of disrupting the communication system used by the General's Elite Commandos, and proved their capability of hacking his holographic broadcasts. The Merovingian, anxious to test the progress of the Oracle kill-code the Apothecary is developing for him, decided to run a field test with a preliminary version of the code. The General picked Agent Pace as the target, and she was struck down by a Merovingian hit squad after being led to a deceptive meeting with Persephone. Meanwhile, Merovingian operatives fought off escalating attacks by Zionite and Machine forces. Zion, hunting for Sati with Seraph, encountered Morpheus' Nabonidus transmission. They were able to obtain a clear reading of the mysterious signal, which should help them track it in the future. The Oracle provided some of her typically elliptical insights concerning Sati, the General, and the Nabonidus transmissions. Zion worked to track down Sati with Seraph, but came to another dead-end. Because of the many recent attacks in Mara, they began keeping the Oracle under guard at undisclosed locations around the city. They detected a new broadcast from the Morpheus Signal, and came across a broadcast saying that they must fight to rescue Neo, although the broadcast skipped, repeating the same line several times. The Oracle returned to Mara briefly with Seraph in order to collect something she had left behind. She invited a group of operatives in for cookies, and had a discussion about the meaning of life, among other things, before she left to catch a train. Persephone and the Apothecary quarreled over the Apothecary's work on the Oracle kill-code, which the Apothecary said needed strengthening with an injection of Beirn's kill-code-laced blood. The Machines located and attacked the Apothecary, but were held off by Merovingian operatives, as well as Beirn and the Apothecary's deadly powers. Later, Cypherites located and attacked the Apothecary as she traveled between train stations in Westview, guarded by Blood-drinkers. She was able to escape at the next station, but chided Malphas for security shortcomings. Agent Pace conversed with Machine operatives in the Government Building, assuring them that she was ready to return to active duty, and better prepared for the dangers involved. Merovingian operatives spying on this meeting reported the Agent's more businesslike demeanor to the Frenchman, who seemed pleased that the preliminary Oracle kill-code he had tested on her had produced an effect. Some time later, the Merovingian joined a party of his operatives in the Hel Club. Flood showed up at the end of the evening to complain about the mess. The Cypherites fought against EPN Code Pulse deployment attempts that ultimately resulted in a local server crash. 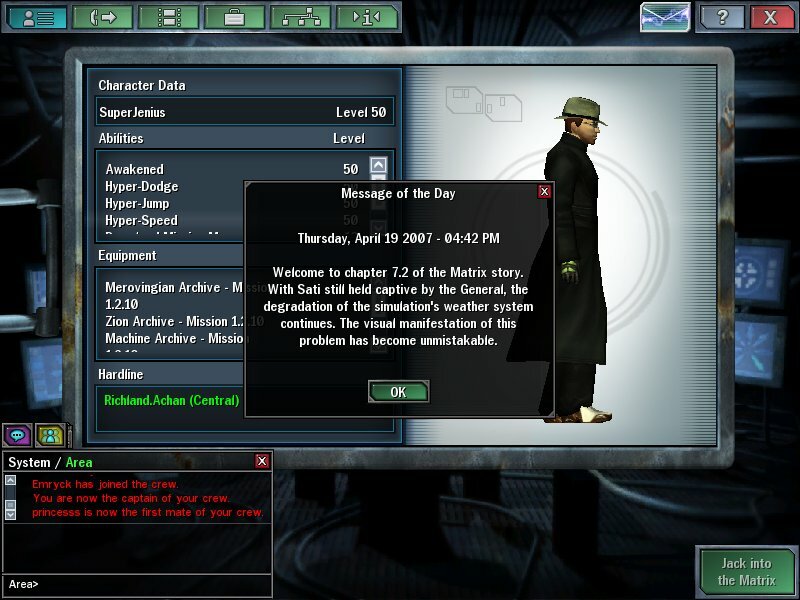 Zion searched for Sati with the Oracle, retrieving a message she had given to one of the General's commandos, and finally finding and rescuing her on a computer disk from a group of decoy clones. E Pluribus Neo searched the city for data, tracking the Morpheus hovercraft beacon signal broadcasts to their source...inside the Matrix. Because true hovercraft beacons must originate in the Real, this finding gave rise to serious doubts about the broadcasts. 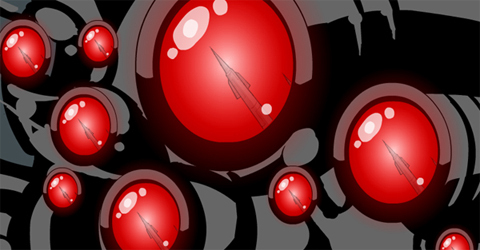 The Machines hunted for the Apothecary, but she escaped through the General's network. The Machines struck back by using data found in the battle at the General's base on the Earth's surface to locate his base of operations in the Matrix, in the complex guarded by Project Nine, beneath the Abandoned Subway. Machine operatives raided the base and deleted all hostile programs found. Agent Pace told the Architect that she had an idea of how to approach the suspicious Cypherites. The Merovingian sacrificed many of the General's commandos to protect the Apothecary from the Machines until she could finish her work on the kill-code to kill the Oracle. The Apothecary, frustrated with the constant attacks, demanded transport out of the Matrix as soon as her work was complete. The Merovingian gave her a commando guard detail and sent her on her way, supposedly to meet the Trainman, while in fact sending his operatives to kill her, and tipping off the Machines to her location. Her commando guards killed, the Apothecary fled on foot, only to be hunted down and killed by hostile operatives in a dark alley in Westview.